In February 2017, Karl Klessig brought together two industry leaders in providing full service document recording solutions, Document Processing Solutions, Inc. (DPS) and SPL, Inc. 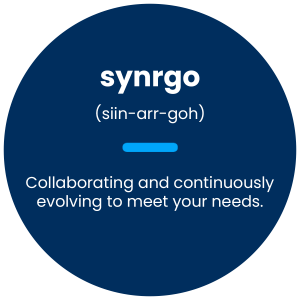 The name SYNRGO was devised from taking a spin on the Greek word for ‘collaborate’ and that is what we intend to do. Collaborate with our customers to ensure we are offering them the best possible services to enhance their business needs. Together we have formed a one stop source for managing, recording, and delivering documents for the mortgage industry. SYNRGO’s foundation includes twenty-one offices nationwide and almost 400 employees, plus its extensive experience of the past twenty-five plus years in all aspects of mortgage document handling. Plans are already underway to further expand its nationwide coverage and offer additional recording services. Karl Klessig, an industry pioneer in electronic recording, has brought together these two companies making it uniquely positioned to meet all the recording needs of the mortgage industry. Karl has been dubbed “the father of eRecording” and was in the forefront of offering eRecording services to the banking industry. He was CEO of Ingeo Systems, Inc. for 11 years until Corporation Services Company (CSC) subsequently acquired Ingeo in 2013. With combined experiences of over 42 years, this new company makes it the most highly skilled and equipped recording service provider nationwide.